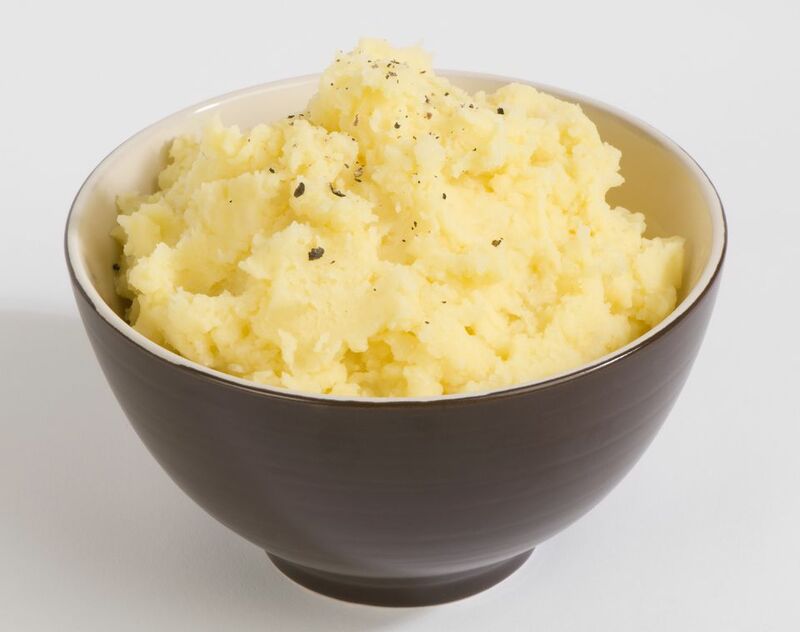 This cauliflower mashed potatoes recipe saves a lot of calories when compared to regular mashed potatoes! Lowfat buttermilk adds extra flavor and creaminess without adding a lot of calories. But the big calorie saver comes from using cauliflower in place of some of the potatoes! When you consider that a cup of boiled potatoes has about 135 calories compared to 25 calories in a cup of boiled cauliflower, you can imagine the savings! Plus, you are giving your body an extra dose of healthy non-starchy vegetables with the cauliflower. Cauliflower lends itself so well to recipes like this one due to its mild flavor. It can be a substitute for higher calorie starchier vegetables in a variety of ways and can be seasoned a number of different ways as well. In this recipes, the cauliflower substitutes for half of the potatoes so that you still get the starchy mouthfeel as well as the flavor of potatoes but with half the calories of mashed potatoes made with straight potatoes. Bring a large pot of water to a boil, then add the potatoes. Turn the heat down, cover, and simmer for about ten minutes, or until the potatoes are fork tender. Drain the potatoes in a colander and discard the liquid. While the potatoes are cooking, place the cauliflower in a medium-sized pot, and fill with about 2 inches of water. Place the cauliflower over medium-high heat until the water comes to a slow boil so that the cauliflower can steam. Cover the pan with a lid and continue to cook the cauliflower for about 5-7 minutes, or until the cauliflower is tender. Continue adding water to the pot if needed to make sure there is always an inch or two in the bottom so that you do not end up scorching your pan or the cauliflower. When the cauliflower is finished cooking, drain the liquid, and allow to cool for about two minutes. Place the cauliflower in a blender. Add 1/4 cup of the buttermilk, and blend until smooth (if you do not have buttermilk, you can easily make your own using milk and vinegar). Place the cooked potatoes in a large mixing bowl. With an electric mixer, blend the potatoes with the remaining 1/4 cup of buttermilk. Add the cauliflower puree, and mix the potatoes and cauliflower until smooth. Add the salt and pepper, and mix well.